Arab from eastern Jerusalem arrested on suspicions of aiding lethal stabbing, in which US tourist Taylor Force was murdered. An Arab resident of eastern Jerusalem was arrested on Sunday on suspicions of aiding the Arab terrorist behind the lethal Jaffa (Yafo) stabbing attack in early March. The Jerusalem Magistrate's Court on Monday extended the arrest of the suspect by seven days. In the attack on March 8, the terrorist murdered US tourist Taylor Force and wounded 12 other victims, before a patrol officer and police volunteer shot and wounded him, and then as he was wounded shot him again and killed him. 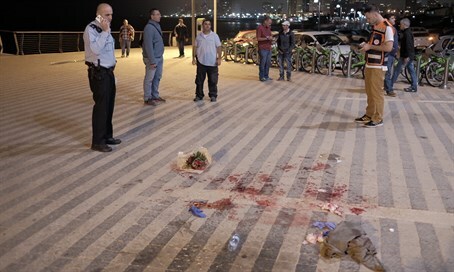 Just on Sunday it was revealed that the Jaffa district police commander and Tel Aviv district commander recommended an honorary citation for the officer and volunteer who chased down the terrorist and shot him dead. The volunteer was filmed shooting the terrorist dead as he lay wounded on the ground, and later explained he did so because he identified an additional threat from the terrorist. The decision to recommend a citation for the two would seem to indicate a sharp double standard, given that IDF soldier Elor Azariya is currently facing manslaughter charges for shooting a wounded Arab terrorist in Hevron in similar circumstances, over fears he was going to detonate a bomb belt.